At this point we looked at each other and reflected on the fact that we hadn't ordered and installed a in-line surge protector on our shore power line. Well, there's no sense in kicking ourselves too hard for being stupid, but now we had to deal with the situation. 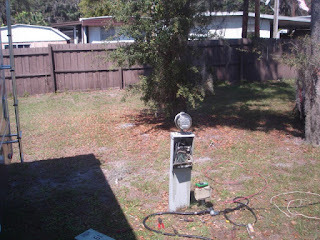 We started trouble shooting at the power pole and tested with a volt meter where there was power, but we didn't like the reading, so we tested and hooked up to the adjacent power pole next to us that did read fine. We checked all fuses, they were good. We tested the trailer end of the shore power line plugged into the pole with a volt meter. there was power. 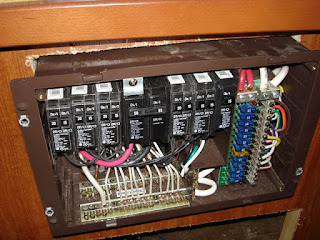 We opened up the breaker panel and tested for power with a volt meter, no power. 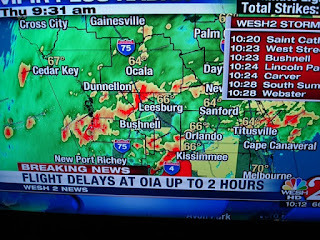 We then fired up the generator, power all around. 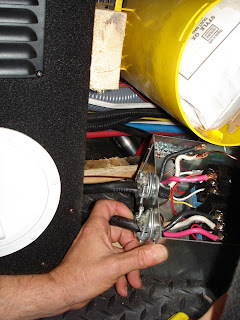 That meant power was getting into the RV but not to the fuse box, there is only one thing between the power inlet and that box, it's the power transfer switch that switches between shore power and the generator. Where is the transfer switch? After a quick call to our RV Dealership it turns out it's accessible through the front storage pass through in our Road Warrior after removing a few screws by the on board vacuum cleaner. A voltmeter test showed power going into the transfer switch, but none coming out. This left us with one conclusion, we had fried the Transfer Switch. Our RV Dealer Serviceman in Minnesota was very helpful, it was 20 degrees and snowing the day we contacted him, so he was more than ready to fly down to Florida and change that part for us. Since that wasn't in the cards, (his boss nixed that idea), he gave us the number of a place nearby that could express order the part and install it for us. 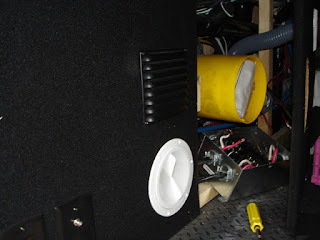 In the meantime, we let the park owners know something had happened and they were very helpful, they called in an electrician who checked our trailer out and helped find and repair our transfer switch, we couldn't hold then liable for our stupidity at not having a surge protector. The electrician rebuilt the shore lot box, it too had fried in the strike. He also tested out all our electrical systems to make sure everything was operating correctly. We are now going to order in in-line surge protector but are still having a tough time sorting through all the options.